The HTC One X+ is a quick update to the company’s flagship – they pumped up the Tegra 3 chipset to higher clock speeds, fitted a bigger battery to compensate and threw in some extra storage to sweeten the pot. Now the question is whether the bigger batter and Jelly Bean are enough to offset the extra power usage from the overclocked chipset. The chipset isn’t doing much during calls, so the extra 300mAh from the bigger battery result in better talk times over what the original One X did. Our unit lasted 45 minutes longer than its official rating too. 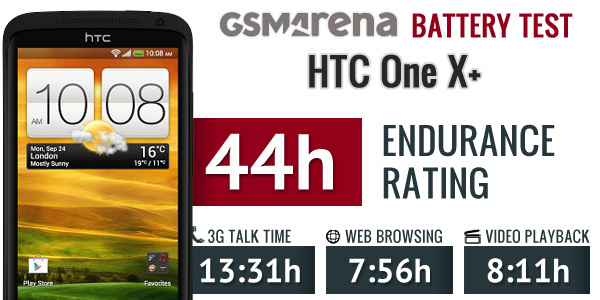 The HTC One X+ really managed to impress us during the web browsing part of the test – it went on for just under 8 hours. Compare that to the 4 hours 18 minutes of the original. We’re sure the move to Jelly Bean contributed to the extra work hours (we’ve seen it on other phones) and there’s the 17% bigger battery, but there’s more to it. We guess the faster CPU can do its work quicker and go back to sleep sooner, resulting in the battery savings. We saw a similar increase in video playback times too – the One X+ lasts 2 and a half hours longer than its non-plus sibling. Meaning if you watch the same amount of video on both phones, by the time the One X dies, the One X+ will still have plenty of juice left in its battery. Overall, the HTC One X+ does very well when it’s busy, it’s one of the top performers in the three categories we test. It’s when it’s idle that something goes wrong – the phone burns quite a bit of energy just doing nothing, so its overall endurance rating stands at 44 hours. Still, that’s potentially a software issue, so it might get fixed. Even if it doesn’t, the One X+ will easily get you through a busy day with a lot of calls, browsing the web and watching videos.